I just walked by the Trellis diner and noticed that it was open and serving customers. I guess reader Rece will now be able to get the Portabello Mushroom Burger Deluxe unavailable last Wednesday when Trellis was closed by Department of Health. 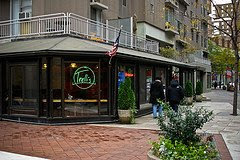 Also, I know that those early bird Roosevelt Islanders who enjoy their 7 AM breakfast at Trellis are happy that it is open. Maybe Nonno's will see that there is a market for early morning breakfast on Roosevelt Island and open early as well. Roosevelt Island on Channel 4 News Tonight at 7 PM. Check out Roosevelt Island 360 and other Roosevelt Island community residents tonight on the Channel 4 News at 7 PM. The Roosevelt Island Tram has been up and running since Wednesday night and will be available for normal service this weekend. Hurray. Also the MTA is reporting regular Roosevelt Island F train service to and from Manhattan for the weekend as well. Double Hurray. Now the MTA needs to get their act together and finally fix the broken Roosevelt Island subway escalators so that they work on a regular basis. There are plenty of things to do this weekend including the start of the Roosevelt Island Outdoor Movie series on Saturday showing the Neverending Story, Roosevelt Island's RIVAA gallery will be showing a film about the sounds that Roosevelt Island makes called A Necessary Music on Saturday night and the Coney Island Mermaid Parade is set for Saturday afternoon. 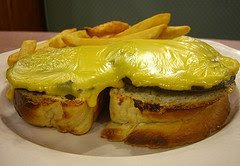 For more ideas on things to do check out Newyorkology or the NY Times. Look forward to seeing some of your favorite family movies on a giant, inflatable, 2-story outdoor movie screen. Blankets, lawn chairs and picnics are welcome. 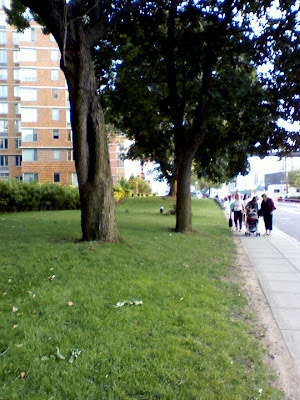 ... to allow more residents and guests access to the site as the gravel path and incline made it difficult for many to attend. offers visitors and New Yorkers a chance to watch a movie, as well as enjoy some of New York City's best outdoor scenery -- from skylines to parks. There are few, if any, outdoor venues in New York City with more beautiful views than Southpoint Park or a more suitable site for an outdoor movie location. 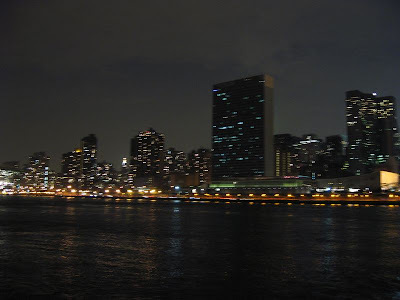 Click on link here to fully view beautiful panoramic nighttime view of Midtown Manhattan as seen from Southpoint Park on Roosevelt Island. 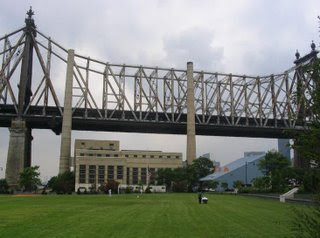 Instead of Southpoint Park, RIOC has chosen as an outdoor movie venue, Firefighters Field, that has views of the underside of the Queensboro Bridge, Keyspan Power Plant, Roosevelt Island Steam Plant and the Riverwalk construction site. Absolutely ridiculous! And a reader of 360's post makes the following excellent observation concerning changing the site from Southpoint Park to Firefighters Field and the importance of special venues for outdoor movies which I agree with wholeheartedly. Once again what sounds like a sensible rationale for doing something is being given as an answer to your question. But changing the venue of these movies is something that significantly decreases the whole movie going experience. It's also taking the easy way out. The first movies shown at SouthPoint were accessible to everyone. The hospitals were part of the organizing team and quite graciously gave their bus to the team for use during the events. Seniors and disabled were picked up on Main St. and driven up the East Side path right to the southern tip, where chairs had been set up for them. During the showing, the bus stood by and made several trips back for anyone who didn't want to stay until the end. Did anyone ask them to do this again? And, if they did ask and were turned down, how about asking the residents for a solution? A fund raiser to cover the cost of a bus could have been done, or a donation box at the showings, or a million other options. I disagree with your statement that "...the idea is to watch the movies anyway." Outdoor movies are as much about the venue as they are about the movie. In fact the movie selection is almost an afterthought. If you want to see a particular movie, you can go to any theater you want and watch in comfort. Outdoor movies are more of a total experience. The whole point of showing these movies in the first place was to introduce residents to SouthPoint Park, which had been closed for years. It was an attempt to get people down to that end of the Island to show them how terrific that area is and what kind of events could be done down there. With all the new residents on the Island, it's a perfect time to do this again. Were the residents asked if they wanted a change of venue, or was the decision made in RIOC without input from their customers (the residents)? 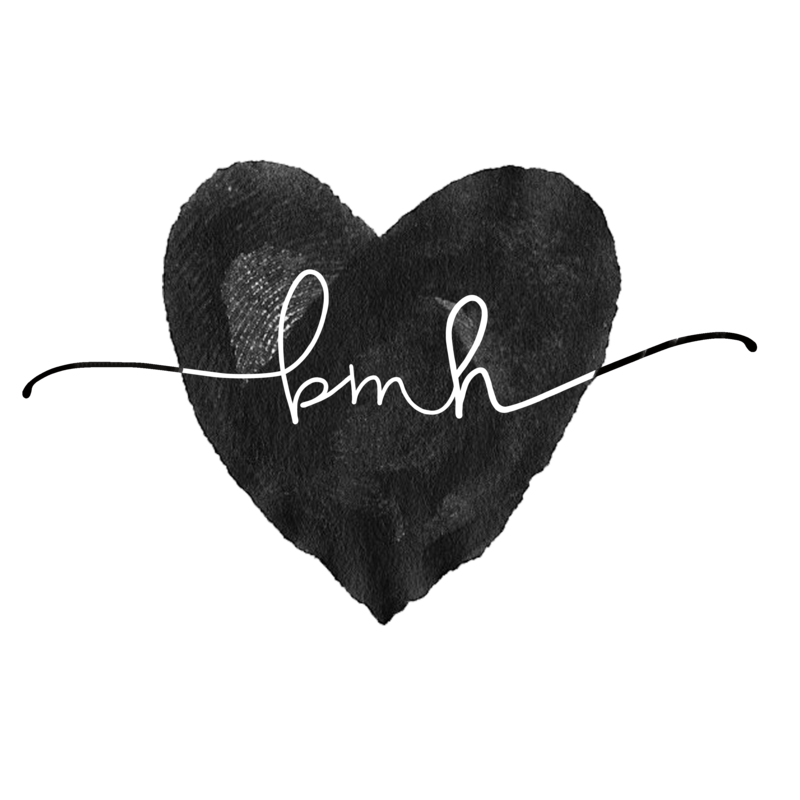 It's not too late to change the location back! The decision to move the outdoor movie venue from Southpoint to Firefighters Field represents the same dull and bleak outlook that thinks destroying Southpoint's East River waterfront and NYC skyline views in order to build the Louis Kahn Death Box (some incorrectly call it the FDR Memorial) is a good idea! I have asked RIOC to return future Roosevelt Island Outdoor Movie Nights to Southpoint Park. I hope RIOC does so and if they do, I am sure arrangements can be made so that anyone who wants to attend will be able to do so. DHCR plans to order an increase in the Rivercross surcharge, levied on residents whose income exceeds the maximum allowed in a building, from 20% to 30%, according to an e-mail from DHCR Commissioner Deborah van Amerongen to Assemblymember Micah Kellner. Van Amerongen said that DHCR staff called the building's managing agent today with the news. In addition, DHCR has approved an increase in maintenance charges which, if levied in one step, would be $7.45 per room (about 2.5%) per month (or $4.97/room/month if levied in two steps). With regard to the surcharge increase, van Amerongen wrote, "...the [Rivercross] Board will be informed of our decision sometime today. If they decide to challenge this that is of course their right, we will argue the case in court." With that one-sentence paragraph, the Appellate Division of the State Supreme Court backed a lower-level decision holding that the Rivercross Board and DHCR acted properly last year when it increased the surcharge for over-income residents. In agreeing with the Court's decision finding no fault with DHCR's handling of the matter, the Court wrote that it "is well established that an agency is to be accorded wide deference in its interpretation of its own regulations... DHCR rationally construes the PHFL [Public Housing Finance Law] to allow Mitchell-Lama cooperatives to be responsible for creating their own individual surcharge schedules, in recognition of the business and practical factors unique to each..."
Also, a 2005 NY Times article on the changing housing dynamic on Roosevelt Island that may still hold true. It is not the prospect of more affluent residents in their midst that rankles, but rather the fear that projects like Riverwalk and the Octagon will spur the proliferation of upscale buildings and tip the balance away from the middle-income interests. "Millionaires' Row is O.K., but don't push us out," Maxine Siegel, an events planner at the City University of New York, said at a tenant get-together in Westview, one of the buildings scheduled to be taken out of the Mitchell- Lama program. "We are open to growth, to people with different economic backgrounds, and we are more concerned with maintaining our homes than keeping out the rich." Here's an excellent resource for issues regarding affordable housing and Mitchell-Lama privatizations - Saving Mitchell Lama. Seems like DHCR might be in an interesting position, having at one time argued that it could leave decisions to the cooperative board(and won!) and now ordering that same cooperative board to impose a higher surcharge? 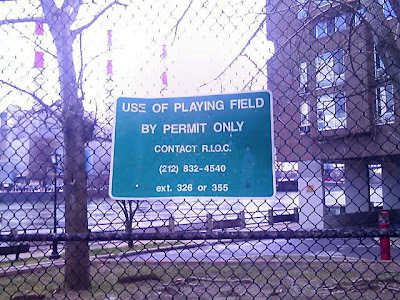 An issue of great concern and resentment by many Roosevelt Islanders has been RIOC's policy that use of the Roosevelt Island playing fields is by permit only. The result of this policy has been that these fields are rented out to corporate groups and leagues, such as Zog, effectively locking out resident adults and children from using these fields during prime playing hours. This subject came up at the RIOC Board Nominee Candidate's Forum as reported by Press HD. Responding to these concerns RIOC has developed a schedule that permits residents to use the fields without permits. 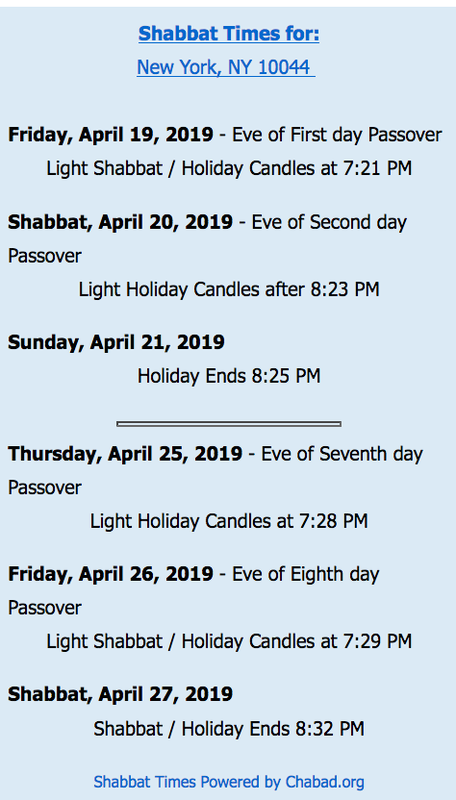 I do not know if the playing times for residents without permits is available only so long as these times are not permitted out to Zog and others or if these playing times are precluded from being reserved by permits. 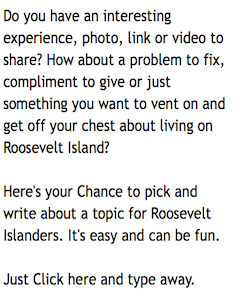 Is Roosevelt Island Site For Future Health Care Facility And Is That Better Than Waterfront Condos For Island's Future? In Manhattan, industry leaders expect the leading health care systems, including New York University Medical Center, NewYork-Presbyterian Healthcare System, and Mount Sinai Medical Center, to seek locations near their present campuses. Sites may include the former Bellevue Hospital site on 30th Street and First Avenue, the Hunter-Bellevue School of Nursing on First Avenue near Bellevue Hospital, and the Solow development site on the former Consolidated Edison property on First Avenue between 36th and 40th streets. Potential expansion may include development on Roosevelt Island, as well in the boroughs of Brooklyn, Queens, and the Bronx. Not many development sites remaining on Roosevelt Island other than the North and South Campus of Coler - Goldwater Hospital. I exclude Southpoint Park from potential sites because that is going to be a park, right? Could this be Coler's fate as part of a modern medical complex or would the existing uses and patients be tossed aside? 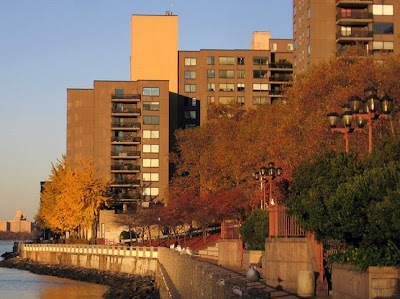 If Coler-Goldwater becomes integrated into a more modern facility it would certainly be better for the current patients than being evicted for waterfront condos but would Roosevelt Island's transportation infrastructure be able to handle any additional development at all. 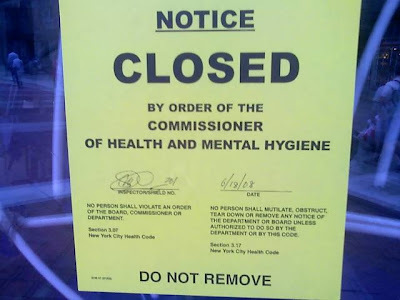 As I was walking by the Trellis Diner this evening, I saw this notice taped to it's window announcing that the restaurant was closed by order of the Commissioner of Health and Mental Hygiene. At this time, no reason given nor is any information provided at the NYC Dept. of Health Roosevelt Island restaurant inspection web page as to why Trellis might have been closed. UPDATE: 6:45 PM - One of the first Roosevelt Islanders to use the back in service Tram kindly sends in this photo of free Roosevelt Island Tram. A brave soul. Nonno's Focacceria - Not DiFara's or No. 28, But Italy and Roosevelt Islander Still Think It's Pretty Good! Our Italian correspondent Alain chimes in on off-Island pizza by highly recommending No.28 on Carmine Street. N.28 is at the very top of the Pizza rankings. I go there often. But still I go to Nonno Pizza as well... And so do all the Italians I know. Very very far away from N.28's level, but not below the average Pizza quality you can find around Manhattan. I haven't been there since last summer but my personal favorite is DiFara's in Brooklyn, though as does Alain, I also like Roosevelt Island's six month old Nonno's. Nonno's square Grandma's Pie with meatballs is excellent. Try it, the cheese is very good. Of course, it does not compare to DiFara's. Very few do. On a hot July day last year, my niece and I waited over an hour for a DiFara's pizza pie. As we were waiting, we felt kind of silly standing around in a hushed, almost cult-like atmosphere of hungry pizza fanatics watching Dom make each pie. But just as we were about to give up and leave, our pizza was done. It was great, unbelievable and worth the wait - at least once a year. Here's a round up of news about DiFara's from Slice and Gridskipper's 2007 top ten New York pizza places. 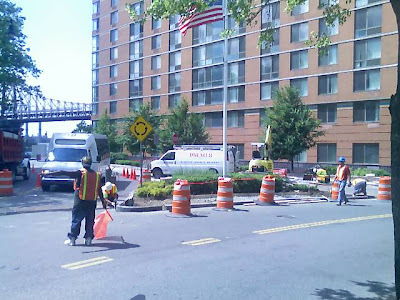 Work is being done today to decrease the area of the Blackwell Turnaround permitting vehicles more room to maneuver but still adding a paved sidewalk allowing pedestrians an easier and safer crossing path. Public Safety Director Keith Guerra explains that this was a top priority for him since he came on the job and that it was suggested by a Roosevelt Island resident. Another good job by RIOC. 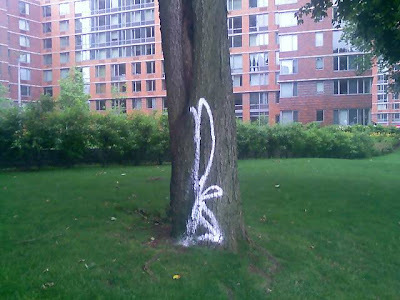 Graffiti Removed from Riverwalk Trees - Will Boat Prow Dock Be Next? We arranged for management in Southtown to do it. Good job by RIOC and Riverwalk management in cleaning up the trees so quickly. We do hire local kids. Clean up of prow only creates tabula rasa. We will do it, again. The shutdown of the Roosevelt Island Tram may even be causing problems for a group of people besides Roosevelt Island residents commuting to and from Manhattan. As readers of this Valentine's day post may recall, the Roosevelt Island Tram was named the second most romantic spot in New York City by Travel Lady Magazine and has also become a popular part of a date. But now, in the Trams absence, what is a couple to do instead? It is obvious that descending the long climb down the stairs into the bowels of the 63rd and Lex subway station to catch the F train to Roosevelt Island hardly compares to the magnificent views experienced while gliding high over the East River in the Tram and would make a pretty awful date. So now, as a temporary alternative, why not try a visit to the West Side Rifle and Pistol Range in Chelsea as did this reporter from SlateV.com. One women described the experience as the best date she's ever been on. Others saw it as a girls night out with a Charlie' Angels theme. But don't forget to come back to the Tram once it is back in service. The trip is marvelous. Here's a nightime Roosevelt Island Tram ride with Hellogoodbye's "Oh it is love" and a daytime tram ride with U2. 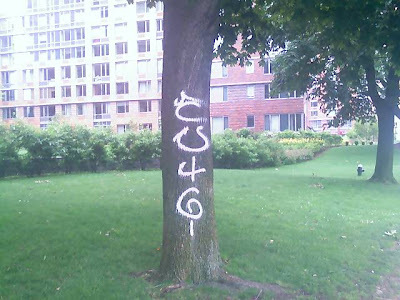 Someone marked up two trees on the Riverwalk lawn with grafitti. Why would anyone do this? It's disgusting. Let's see how quickly this gets cleaned up. Still waiting for the boat dock prow to be cleaned up. 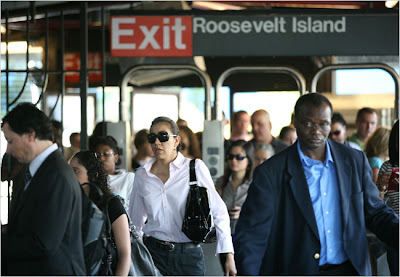 MTA's Solution To Roosevelt Island Transit Woes - Not More Trains But More Staff On Platform To Cram Us Into Subway Cars! Peter G. Cafiero, chief of operations planning for New York City Transit, said the authority had received several complaints from island residents about service at the station. Incredible! The MTA's solution is to add more staff members to the overcrowded Roosevelt Island platforms to somehow assist riders. How exactly are they going to assist us? By stuffing us into packed subway cans like they do in Japan with "Subway Pushers"? Fellow blogger Roosevelt Island 360 captures the sights and sounds of Roosevelt Island Day 2008. Take a look.